When we used to watch the apocalypse on TV, we always saw people finding shelter. Old schools, houses, hospitals - anywhere you could lay your hat. Domesticity was restored in unlikely places - heck, plenty of post-apocalyptic shows had people living in houses beset by zombies, while their lawns always looked freshly mown. We all figured "if it ever happens, we'll be fine. Don't worry." Then the apocalypse happened, like some of us always suspected it would. It wasn't fine - far from it. Sure, we found places to hide out, to get out of the punishing sun and away from the hundred-mile-an-hour gales that threw sand in your face. But we didn't think about the windows. 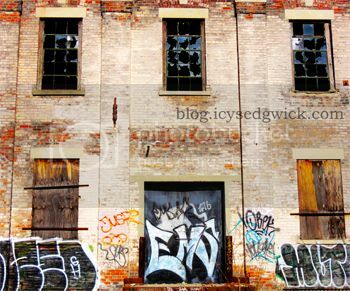 When we went looking for new homes, we couldn't find buildings with glass intact. The walls kept out the sun, but the wind? You need windows to shelter from that. So we did what we could. We boarded some windows up, or made makeshift shutters. Occasionally we'd duct tape the larger pieces of glass together, but some windows ended up more tape than glass. Mostly we used tarpaulins we hauled out of the vans that didn't run any more, or plastic sheeting we found in skips or abattoirs. Bin bags were especially useful, and they became a weird kind of currency as we hunkered down in our reclaimed homes, squatting in town halls and shopping centres, trying to reboot society with whatever we had to hand. It's funny, we used to watch the world through television screens. Now we watch it through plastic sheeting. Original image by beermug. Edits by me. It's hard to believe that it's some nine years since the first of the so-called 'Cornetto trilogy' was released, with Shaun of the Dead providing a British take on the zombie genre. Some three years later, in 2007, Hot Fuzz did the honours with its combination of action movie heroism and Midsomer Murders 'weird village'. The World's End is a peculiar hybrid of the two, with a helping of Invasion of the Body Snatchers for good measure. Simon Pegg plays Gary King, a somewhat unlikeable guy who's never matured from the seventeen year old who once attempted the so-called Golden Mile, a pub crawl that takes in twelve pubs as it wends its way through the small town of Newton Haven. His four friends have all grown up and gotten proper jobs, and started families, but Gary still lives for the night that they never finished the Mile. Apparently the idea came from a pub crawl director Edgar Wright once started but never finished, and he liked the idea of a quest that was never completed. Gary certainly treats it as such, as though to conquer the Golden Mile would allow him to, in a way, conquer the version of himself that has never allowed him to move on with his life. In an attempt to get closure, he manipulates Andy (Nick Frost), Oliver (Martin Freeman), Peter (Eddie Marsan) and Steven (Paddy Considine) into accompanying him on one last hurrah. One of the things they've said about the film in interviews is that "you can never go back" (which I think isn't true as I returned to Newcastle after seven years in London and fitted back in), and the point here is that the friends find it difficult to enjoy the pub crawl as they think they've changed too much since leaving the town. After a brutal fight in a pub toilet, they soon discover that it's not them who has changed - it's the town. The inhabitants have been replaced by what they believe are robots, which leads to several debates in which they attempt to come up with a name for said 'bots' ("Smashy smashy egg man" is a particular classic). Can they get out of town before they're replaced themselves? More importantly, can Gary finally finish the Golden Mile? I can honestly say that I half-detested Gary for the first third of the film or so - but I think in some ways that's the point. It's never made entirely clear why the others liked him even as a teenager, as he behaves like an absolute spanner, but then never having been a teenage boy I don't know how these things work. In many ways, he's the Peter Pan of the story, leading his Lost Boys on another adventure. Even when the friends discover they're surrounded by robots, and they're repeatedly attacked by them, Gary's determination to finish the pub crawl is, in a bizarre way, almost commendable. Of course, the film's denouement allows some explanation for his behaviour, and Pegg pulls it off in the way he always manages to do. However, the real revelation of the film is Nick Frost, playing Gary's best friend at school, Andy. There has been a lot of bad blood between Andy and Gary, and Andy is determined to remain teetotal on the pub crawl. Being attacked by robots is enough to send anyone over the edge, and there is something of a Hulk-like transformation when Andy goes back to the drink, and watching him batter his way through oncoming hordes is nothing sort of visual ballet. The makers came up with a new form of combat nicknamed 'pub fu', an amalgamation of kung fu and bar room brawl, and it feels very much like you're watching men who learned to fight watching wrestling and movies as children. It's brilliant! As with the previous two films, there are plenty of appearances by the actors from both the earlier films and various other Channel 4 comedies, as well as two higher ranking stars in the form of Rosamund Pike, who plays Oliver's sister Sam, and Pierce Brosnan, who plays a former schoolteacher. It's nice to watch Pike giving as good as she gets, but I couldn't help wondering at the absence of Jessica Hynes. It feels a little slow to get into second gear, but the film becomes much funnier once they realise that all is not as it seems in Newton Haven. It's entertaining, and I think the 'moral' of the film can be summed up in the sense that nobody's perfect, but if you just try the best you can, you'll get there in the end. Maybe we could all learn from that. 'And I looked, and behold a pale horse: and his name that sat on him was Death, and Hell followed with him'. Revelation 6:8, King James Bible. 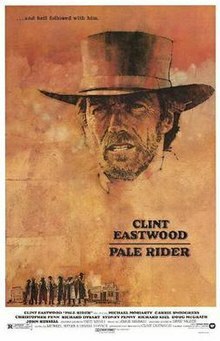 I watched Pale Rider (1985) for the first time yesterday, and I have to say that I was impressed. It might be a slow burner in places, but I'd expect nothing else from Clint Eastwood. 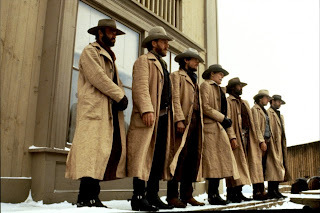 Yet despite its similarities to the earlier High Plains Drifter (1973), I think there's a lot to learn from the film's use of character, particularly regarding antagonists and protagonists. The plot, in a nutshell, is fairly simple. Set sometime in 1880s California, a small mining camp has grown up alongside a stream believed to contain gold. Local mine owner Coy Lahood (Richard Dysart) sends his thugs to vandalise the camp in an effort to force the people to leave. The thugs shoot a small dog belonging to a teenaged girl, Megan (Sydney Penny), who prays for a miracle while burying her pet. Lo and behold, a man known only as Preacher (Clint Eastwood) turns up, and manages to galvanise the camp into staying put, and fighting for their claims. Lahood calls in a corrupt marshal, named Stockburn (John Russell), and the stage is set for the final showdown. Spoilers ahead, if you haven't seen it, though in all honesty, you'd probably be able to guess the ending anyway! The notion of an outsider coming in to help a group of people against a violent threat sounds similar to High Plains Drifter, but Preacher is a more positive figure than that of the Drifter. In addition, while the townsfolk of High Plains Drifter were guilty of earlier crimes, the campfolk of Pale Rider have committed no crime, and are therefore innocent, making Preacher a protector. Yet he isn't actually the hero - he's a facillitator. 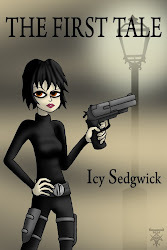 It's important to establish in any story who your protagonist and antagonist are. In Pale Rider, Coy Lahood is clearly the antagonist. He wants the camp gone, and he'll do anything to get his way. You might initially think the protagonist is Preacher, but you'd be wrong. The real protagonist is miner Hull Barrett (Michael Moriarty), who we see demonstrating both bravery and determination early on in the film. Once the initial raid is over, it is Hull who ventures into town, despite a beating on an earlier visit. He refuses to be cowed by Lahood and his men. It is also Hull who repeatedly tries to break a massive boulder in a stream, a boulder he believes hides a gold vein. Hull's belief is proven true, and he finds gold, which he uses to pay the camp's debts in the nearby town. He tells Preacher that he won't blast the rock as it will destroy the course of the stream, which sets him in direct comparison with Lahood who blasts anything that gets in his way, regardless of what it does to the landscape. Hull has also taken in Megan and her mother Sarah (Carrie Snodgress) after Sarah's husband abandoned her, yet he doesn't force her into marriage until she's ready for it. Hull is not presented as a hero, but his actions betray him as such. Characters in the film refer to him as "decent" and "good", and he shows he is both of these. He isn't the same man of action and obvious hero as Preacher, but his stirring speech to the camp when they consider selling up also helps to cement him as a 'go to' guy. Preacher is set up as being the character who must face down the bad guy, and through a vague reference to a history with Stockburn, we realise that the shoot out will be between this pair. It's difficult to consider Stockburn as an antagonist as he has simply been hired by Lahood, in the same way that Preacher cannot be the antagonist since he shows up later in the film than Hull. Hull initially attempts to accompany Preacher into town, but after destroying Lahood's mining operation, Preacher scares Hull's horse away so that he will be left behind - Preacher wants to keep him safe. He heads into town and has his shoot out with Stockburn, but Lahood remains alive, and attempts to shoot Preacher. Hull appears, having walked into town, and shoots Lahood. The protagonist has defeated the antagonist with the help of a facilitator - Preacher both awakens and illuminates heroic qualities within Hull to enable him to become the hero of the story, so that Hull can remain the hero even after Preacher leaves. So what's my point? Well what I'm saying is that your protagonist needn't necessarily be the guy who comes in, all guns blazing. He should be the guy who develops and grows throughout the narrative, even if he needs help to do so. Don't be afraid to give your hero a helping hand. 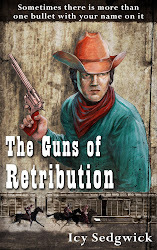 If you like your Westerns gritty or pulpy, my novella, The Guns of Retribution, is available for Kindle through Amazon US (99c), and Amazon UK (77p).